Extra Accessories so you always have cups and Blades at your fingertip. Whether you are getting ready to make a nourishing Nutriblast, a snappy salad dressing or a delectable dessert, you will always have a clean cup and blade waiting to do the job! Perfect for those who like to enjoy Extracted nutrition at every meal and for larger families that need more cups. Unlock the hidden nutrition inside the foods that you eat. 100% compatible with NutriBullet 600W and Nutribullet Pro 900 High-Speed Blender/Mixer System. Features Comfortable Handel and a screw off lip ring for a smooth drinking experience. 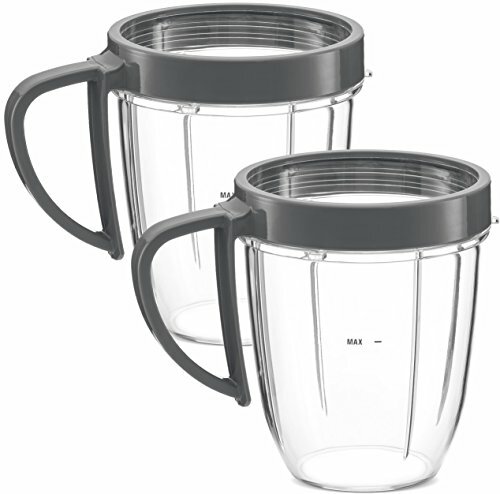 INCLUDES: Two 18 Oz Small Replacement Cups/Jars for NutriBullet with Comfortable Handel and Two Screw-Off Lip-Rings, by NUTRiGEAR. HIGH QUALITY and DISHWASHER SAFE: Made from High Impact BPA Free Plastic that is 100% safe for dishwasher. No bubbles or cracking of plastic.Threads are smoothed for easy on and easy off. NOT COMPATIBLE: This blender cup will NOT work with the NutriBullet Lean (1200 watts), NutriBullet RX (1700 watts), Original Magic Bullet or Ninja Blenders.